Posted on 3, October 2016 by EuropaWire PR Editors | This entry was posted in Art & Culture, Automotive, Management, Marketing, United Kingdom and tagged Berkeley Square, Charles Kaisin, David Martin, Ellen Vanherck, origami installation, Rolls-Royce, Rolls-Royce Motor Cars London, Spirit of Ecstasy. Bookmark the permalink. LONDON, 03-Oct-2016 — /EuropaWire/ — Rolls-Royce hosted an exclusive Surrealist Dinner in London last Thursday to celebrate the Art Programme’s collaboration with Belgian designer Charles Kaisin. The event coincided with the premiere of his origami installation, inspired by the Spirit of Ecstasy, the iconic symbol of the marque that has adorned the bonnets of Rolls-Royce motor cars for more than a century. 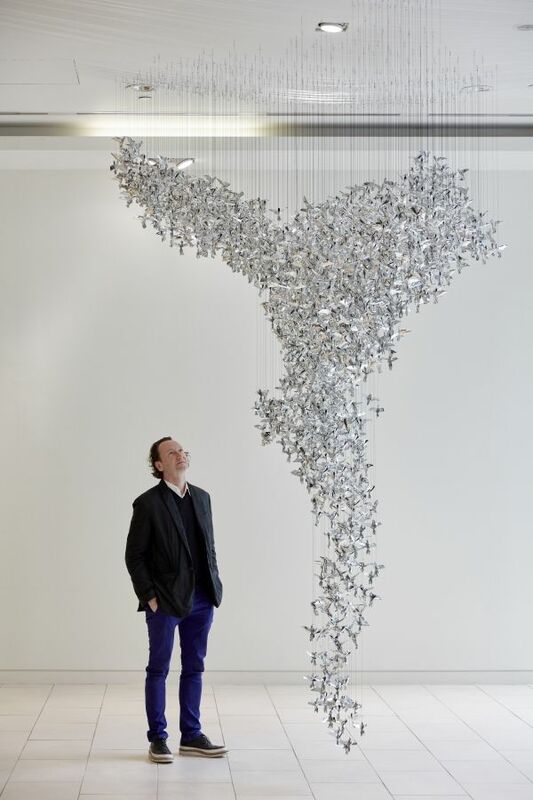 The work, comprising 2500 miniature depictions of the graceful mascot, will be suspended from the ceiling of Rolls-Royce Motor Cars London in Berkeley Square until Sunday 16 October. Following this, Ellen Vanherck from the Royal Academy of Music in London and Eline Antoinette Vandenheede from the Guildhall School of Music and Drama in London performed a beautiful rendition of Flower duet from Leo Delibes’ opera Lakmé and Canzonetta sull’aria from Mozart’sLe Nozze di Figaro, accompanied by pianist Chavdar Mazgalov. After the performance, the singers revealed that their kimono-style costumes were part of the white tablecloth, which were withdrawn from the table as they exited in a performative fashion, adding a fitting element of theatre. Black cloth was revealed underneath in preparation for the arrival of the next course of a soup served in a chemistry-style flask. The soup was presented by masked servers dressed in silver jumpsuits, representing the Silver Ghost, one of Rolls-Royce’s defining motor cars.